The Spring Soccer program runs from April through early June for children in grades PreK-12. It's also available to some college freshman, depending upon the players age. Games are held on Saturdays. The Spring program is a travel league for grades 3-8. Teams will play against other towns on the South Shore, some games will be home and some will be away. Tryouts are required for players in grades 5-8 and will be held in October. All players in Grade 3 and up will receive a full uniform. Shin guards and cleats are required for all players and should be worn during skill sessions and games! Players are encouraged to bring their own appropriately-sized soccer ball (Grades K - 2: size 3. Grades 3 - 6: size 4. Grades 7 : size 5) and water each week. Practices for players in grade 1 and up will be run at the discretion of the coach. Ideally one practice per week sometimes 2 in the higher grades and then one game on the weekends. The Spring Season begins in April. Games are played on Saturdays and teams generally practice 1x/week during the week (day & time at the coach's discretion) while daylight permits. Home games will be played at Forge Park Pond on King Street. PreK single gender in-town developmental program. The PreK Program is an in-town developmental program. Each week participants will receive approximately 30 minutes of group based skills. Our Spring PreK program is for children enrolled in PreK for the current school year. Kindergarten single gender in-town developmental program. Each week participants will receive approximately 30 minutes of group based skills followed by a 30 minute scrimmage. Our Spring Kindergarten program is for children who are currently enrolled in Kindergarten. 1st Grade single gender in-town recreational team play. The Grade 1 Program is an in-town recreational (no standings) team program run by HYAA volunteer coaches. The program is organized into separate boys and girls divisions. Single gender teams play weekly small sided officiated games (with referee) on Saturdays, beginning early in April. Teams typically practice once a week (day & times) at the discretion of each coach. All games are held at Forge Pond Park. 2nd Grade single gender in-town recreational team play. The Grade 2 Program is an in-town recreational (no standings) team program run by HYAA volunteer coaches. The program is organized into separate boys and girls divisions. Single gender teams play weekly small sided officiated games (with referee) on Saturdays, beginning early in April. Teams typically practice once a week (day & times) at the discretion of each coach. All games are held at Forge Pond Park. Grade 3-12 single gender teams travel & compete in the Coastal Youth Soccer League. The start of the CYSL Travel Season is scheduled to begin for all U10-U14 players the first weekend in April. Our High School teams typically start mid-April. The CYSL does play on school vacation and Memorial Day Weekends! Please see more information below for program specifics by grade. Grade 3-4 Spring. HYAA's Grade 3/4 teams participate in the CYSL 7 v 7 (6 field players & a goalie) Division 3 (no try outs). 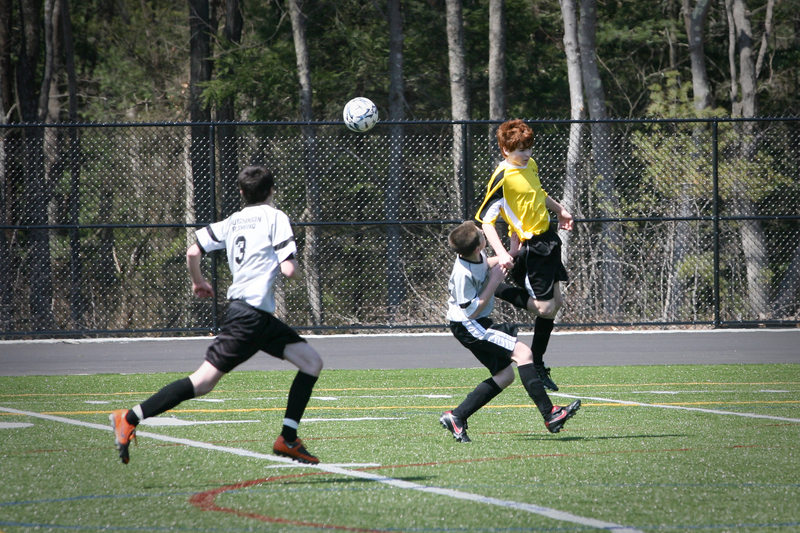 Scores are reported strictly for the purpose of pairing teams for play in the season's culminating CYSL U10 Jamboree held in Duxbury the first weekend in June. The jamboree is conducted utilizing a recreational round robin format. There are no league playoffs, championship, etc. at this level. The Grade 3/4 division maintains a 50% playing rule policy - which means every player's experience will be that of a 50% playing time minimum. No Try Outs - all registered players will be placed on a team. U10 Games will be on Saturdays (times TBA). U10 Practice: generally 1x/week at the day/time @ the discretion of coach. Please note our 3/4 teams must be submitted to the league in January. Once number of teams is set we have a limited number of players we can accept into the program. Be sure to register on time, we may not be able to accomodate late registrations and there is usually no Waitlist for this age group. Grade 5/6 - 7/8 - 9/10 - 11/12 -Spring. All U12 teams in the CYSL play a 8 v 8 format. All U14 teams and older in the CYSL play a 11 v 11 format. HYAA enters one team in each age group in Division 1 and the remainder of teams in Division 2. CYSL Standings are maintained during the regular season to determine which teams qualify for post season play. At the conclusion of post season playoffs, a CYSL Champion is crowned in each Division (both 1 and 2). CYSL Division 1 and CYSL Division 2 Championship teams then advance to compete at the state level in their respective divisions at the Massachusetts Tournament of Champions (MTOC) in mid-late June. Grades 5-8 registration opens in October. Registration closes after teams are set (mid November) and late adds are only accepted if there is room on a team. Grades 3-4 registration opens in November and closes mid-December. Late adds are only accepted if there is room on a team. A late registration period will follow the 3 week registration period at which time an additional $35.00 late fee will be added to all registrations. Players must accept or decline their spot on a Travel Team by December 31st or be ineligible for a refund. Open online fin October through January or until teams are full.